While exploring a small side canyon off of Indian Creek I came across this anthropomorphic petroglyph all by itself. The square and tapered body reminds me of the many Fremont figures I have seen further north, but the Fremont are not thought to have lived in this area. Perhaps the Anasazi copied the style or maybe the Fremont passed through or camped in this area while hunting? 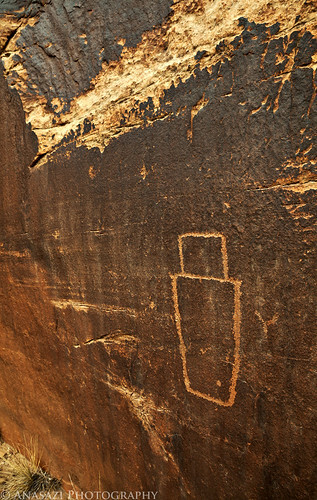 While we will never know the exact origin of this petroglyph, it’s still an interesting yet very simple figure.